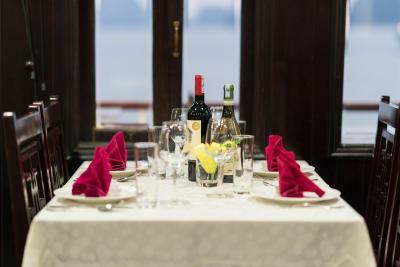 Lock in a great price for Halong Paloma Cruise – rated 9.1 by recent guests! Incredibly hard-working staff who are always willing to go the extra mile. We did the 3day-2night itinerary and we are glad we did because the second day had a lot more relaxing and sightseeing time! The food was excellent and plentiful. Rooms have lovely views of the bay and the bed was very comfortable. The suite we booked was a good size for a couple. The shower really made the room, very hot water and good pressure. The bed was comfortable and clean. Lunch and dinner was 7 course, with a lot of variety, though the serving size of each dish wasn't very large. Vegetarian options were available, but didn't match the quality of the meat options. Breakfast was fantastic, very fresh prepared foods and juices, better than you would find at a standard hotel. Activities were okay. We were most looking forward to kayaking, but we only had 1 hour and had to stay near the guide for safety. We felt this was limiting as we really wanted to explore the area. The kayaks were free though, included in the trip fee. The staff were all very friendly and accommodating, and didn't try to hide any drink or food costs. Overall a wonderful experience sailing with Paloma in Halong Bay! The staff were very friendly and accommodating, especially the tour guide. All the activities were a lot of fun and never felt too crowded. Food was quite good as well. Beds were super comfortable! The rooms were lovely an clean and the staff was very accommodating. The food was ok and general feel of the boat is great. Kajaking is nice even though a bit rushed. Staff was super energetic, and lovely. Food was great. Boat was nice. Staff was amazing, food was amazing. Beautiful views. Great day yours. Amazing activities and the food was incredible. Location was stunning and the facilities and staff were great too! We had the suite and the room was lovely and big and bed comfy. The staff were friendly and attentive. They tried to make the experience as fun as possible and our main host was quite funny. Good sized boat, not too many people on it. The staff Jacky and Justin were excellent hosts. 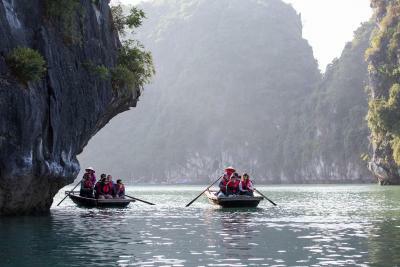 The excursions which were part of the cruise were well organized and ensured we saw the best of Halong Bay! 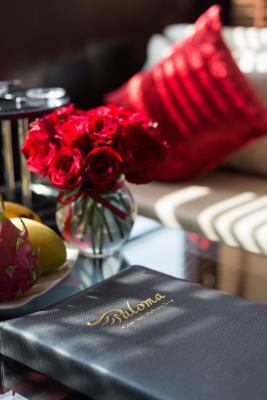 Halong Paloma Cruise This rating is a reflection of how the property compares to the industry standard when it comes to price, facilities and services available. It's based on a self-evaluation by the property. Use this rating to help choose your stay! 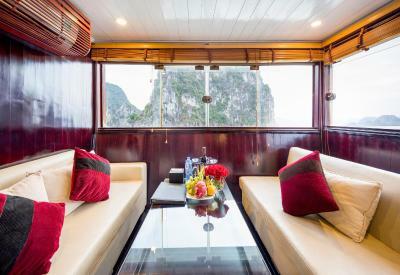 One of our top picks in Ha Long.Housed in a traditional wooden boat, Halong Paloma Cruise offers cabins with stunning views of the well-known Ha Long Bay, a UNESCO World Heritage Site, as well as a New World Wonder 2011. It has a rooftop sun terrace and provides free Tai Chi lessons on-board. 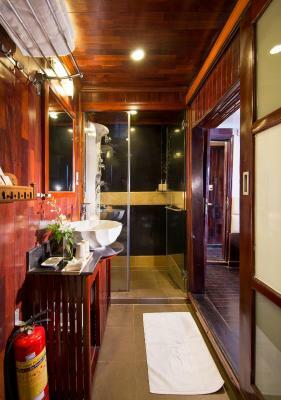 Featuring traditional and modern-inspired interior design, air-conditioned cabins come with parquet flooring, a wardrobe and in-house telephone. A safe and mini-bar are also included. 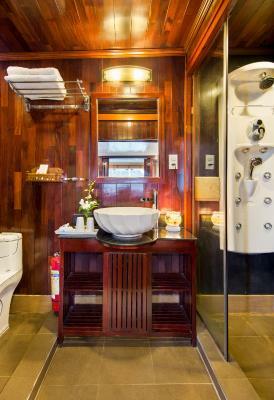 The private bathroom is fitted with modern shower and provides a hairdryer, slippers and free toiletries. Halong Paloma Cruise operates a 24-hour front desk where guests can get assistance with luggage storage and other requests. Paloma Cruise's itinerary sails guests to two beautiful bays, namely the natural and remote Bai Tu Long bay and the touristy Halong bay. During the stay, guests can enjoy various activities such as fishing and kayaking, free of charge. Massage treatments can also be arranged upon request at a surcharge. 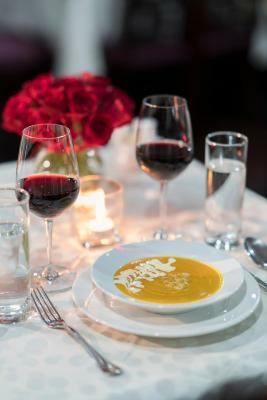 The on-board restaurant serves a delectable spread of Vietnamese and Western cuisine from 7:00 to 21:00, while a variety of drinks are offered at the bar. Original Vietnamese coffee and Sunset Party cocktails are served free of charge daily. 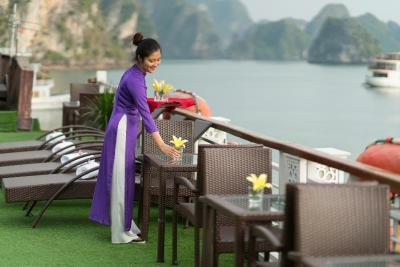 When would you like to stay at Halong Paloma Cruise? Located on the upper floor of the cruise, this air-conditioned room offers views of the ocean. It features parquet flooring, a wardrobe, seating area and private bathroom. A safe and mini-bar are also available. Public parking is available at a location nearby (reservation is not needed) and costs VND 81756.73 per day. Suite is located on the upper floor of the cruise. Featuring a private balcony with lounge chairs and panoramic sea views, air-conditioned suite comes with parquet flooring, a wardrobe, seating area and private bathroom. A safe and mini-bar are also available. 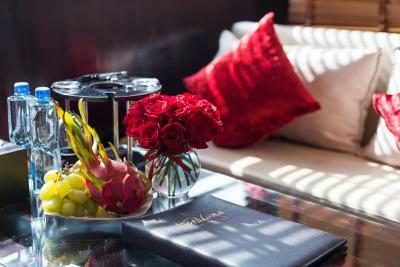 Suite is located on the upper floor of the cruise. Featuring large windows with panoramic ocean views, air-conditioned suite comes with parquet flooring, a wardrobe, seating area and private bathroom. A safe and mini-bar are also available. Located on the first floor of the cruise, this air-conditioned room offers views of the ocean. It features parquet flooring, a wardrobe, seating area and private bathroom. A safe and mini-bar are also available. 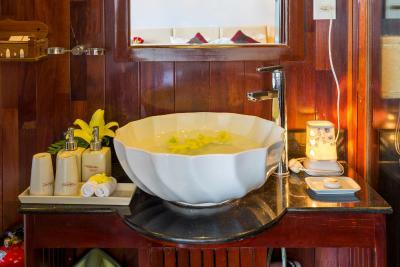 House Rules Halong Paloma Cruise takes special requests – add in the next step! Halong Paloma Cruise accepts these cards and reserves the right to temporarily hold an amount prior to arrival. Guests are required to provide the hotel name, address and contact number in Hanoi at least 48 hours in advance for the pick-up service. Private car transfer is available upon request. Children whose travel documents are attached to the parent's passport, must be accompanied by said parent. If you have any dietary requirements (e.g. vegetarian), please inform the cruise before departure. The cruise check-in begins strictly from between 12:00 noon to 12:30 from Halong Paloma Office (Vinashin Wharf, No 6 Le Thanh Tong street, Hon Gai Harbor, Ha Long City, Quang Ninh). Guests disembark from the cruise ship at 11:30 at the end of the journey. In case of cancellation due to bad weathers to guarantee the safety of tourists, different policies will apply. 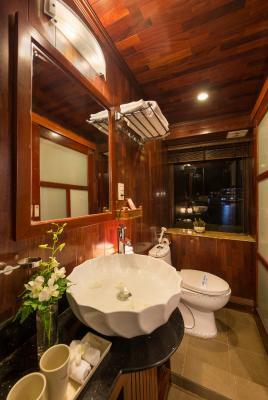 If the cancellation is informed before guests leave Hanoi to Halong Bay and guests have not used any service yet, guests are eligible for a 100% refund. For other cancellation scenarios where the cruise already started, partial refund policies apply. Kindly check with the cruise company for more information. The cancellation is announced ONLY by Quang Ninh Local Port Authority and not by the Halong Paloma. Please inform Halong Paloma Cruise of your expected arrival time in advance. You can use the Special Requests box when booking, or contact the property directly using the contact details in your confirmation. We had to check out of our rooms too early. 9.30 am. Disappointed not to be able to stay in it longer. If anything, too much food! 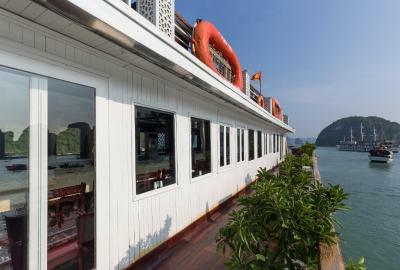 This has to be the best way to see Ha Long bay. Rooms are comfortable and have en suite. The boat itself is impressive and the staff are very professional. Kayaking was the highlight! 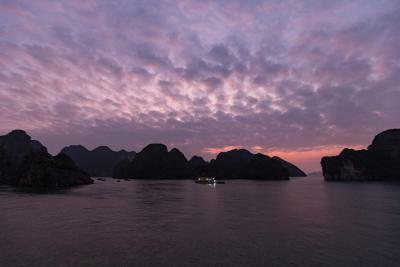 This is one of the more inexpensive cruises around Ha Long Bay too. The mini bus that took us from and back to Hanoi was very fancy too. Cyclical type noise from the ship's motor interrupted sleep. Service staff and guide were great. It was a relaxing trip! The transport van back was roomy but seats were very uncomfortable. The rooms are a little tired and need a some up-keep, however it is understandable as there is always so many people on the boat and a constant cycling of people. The room was clean, however there was a large cockroach crawling on the backboard of the bed, we had to kill it before it could climb on the bed. The guided kayaking was a bit limiting, but it's understandable. The cave and fishing village were a bit boring, but these activities are standard for any Halong Cruise tour. Biggest complaint is that water was not included at all and priced quite expensively (30K for a small bottle) so I would recommend bringing your own water. Other drinks were also not included, but we didn't expect this anyway. Went with friends for 2 days 1 night. The view is scenic, weather was beautiful. The perfect balance between activities and relaxing. They take you through the beautiful islets. The kayak was great too. staff are super friendly. Service was brilliant. Not too crowded at all. Would recommend this for families too. The early wake up call - 6:45 am is not very relaxing! 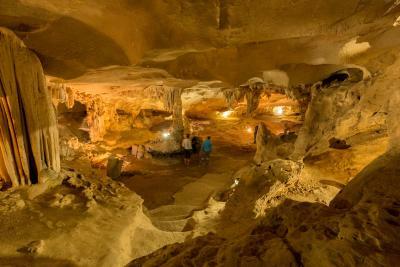 If you book this tour you have to be aware it is very touristy and the itinerary is rushed. The boat goes were a lot of others go so the sights are quite packed and there will be no possibility of swiming or relaxing. But if you like guided tours this is a good one. The shuttle bus from Hanoi was, well, hectic to say the very least. Not for the faint of hearts as there is a lot of swerving in between lanes of traffic. I don't think that's necessarily avoidable in Vietnam, though. So nothing against Paloma here. 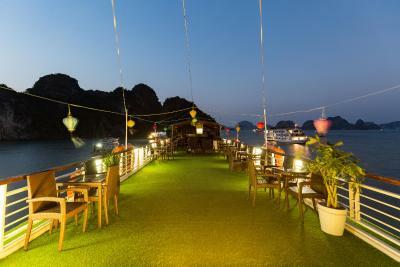 Do not miss out on Ha Long Bay - it's absolutely worth all of the hype. The Paloma staff were kind, welcoming, funny, entertaining, everything we could have wanted and more! The food was incredible and the activities kept us busy all day long. Really enjoyed that the Paloma cruise went to the less trafficked bay as it was still filled with boats, but we were able to visit without interruption. The room was sort of small but It wasn't uncomfortable. All staffs are nice and have professional attitude. The program in the cruise was really fun. We stayed a day on the cruise. I've got unforgettable memories! Everything was exceptional. All the staff was very friendly, fun and helpful. Food absolutely amazing Excellent organisation from everyone involved. Room was good size and clean. I would do it again and again.